Rodgers throwing motion now is drastically different than it was coming out of Cal. Hear him explain why. Aaron Rodgers is deadly with a football. When it comes to accuracy, arm power and creativity, there's simply no other quarterback who can do what Rodgers can with the football. At the time of this writing, Rodgers has 23 passing touchdowns to just one interception on the season. He's also thrown 368 consecutive passes without being picked off, which is a new NFL record. It wasn't always this way. Coming out of Cal, Rodgers had some serious flaws in his game. One of them was an inconsistency on deep balls. "I wasn't great, throwing deep balls, coming out of college. I really worked on this and tried to perfect it. I just picked at my game. I asked for a lot of harsh criticism," Rodgers told the Milwaukee Journal Sentinel in 2015. As you know, Rodgers is now one of—if not the—most lethal deep-ball passer in the NFL. How'd he manage such a turnaround? For one, he was able to dial in on his mechanics and throwing motion during his first three seasons in the NFL. Since Brett Favre was still the unquestioned starter during that period of time, Rodgers was afforded the opportunity to focus on his development. Rodgers' mechanics left a lot to be desired when he first entered the NFL. He held the ball up by his ear as he surveyed the field, and his delivery was far from fluid. Many of these deficiencies were attributed to Jeff Tedford, Rodger's head coach at Cal. Tedford had a history of coaching quarterbacks who put up eye-popping numbers in college yet fizzled out in the NFL. Before the 2005 NFL Draft (where the Packers selected Rodgers with the 24th overall pick), one anonymous NFC scout told the Milwaukee Journal Sentinel that Tedford-tutored quarterbacks were "too well-schooled. So mechanical. So robotic. I don't know if they become good pro players. I think Rodgers is in that same mold." Once he arrived in Green Bay, former Packers head coach Mike McCarthy and former Packers quarterback coach Tom Clements went to work on Rodgers' mechanics. Perhaps most importantly, they gradually helped him hold the ball lower in the pocket. Eventually, Rodgers became comfortable holding the ball between the middle of his chest and his throwing shoulder. This allowed him to better recruit his lower half into throws, increasing his rotational power and making his delivery much more fluid. 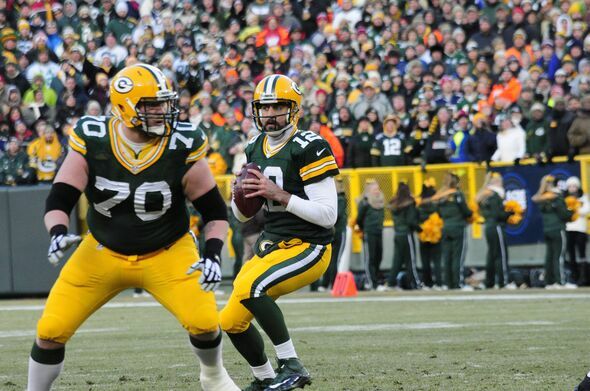 If you ask Rodgers about his mechanics today, he's quick to point out how vital a role his lower half plays. "You throw the football from the ground up. You want your feet in a positive position. You want to transfer power from the ground, to your hips, to your shoulders, to your release point. It's something that you have to work on. It's not natural. It's not exactly the guru type of throwing that we've seen from some of these guys who've been teaching quarterbacks over the years," Rodgers told STACK. "But there's a few of us in the league who are pretty efficient at it. It involves harnessing your power and off-setting your arm as much as possible." To hear Rodgers tell it, his right arm itself isn't actually all that important. It's more about have powerful and stable structures that transfer energy into his arm. His actions back up this philosophy. During the 2017 offseason, Rodgers went a solid month without throwing a football—the most time he's taken off from throwing that he can remember. Instead, he focused on building lower-body strength and stability. "I don't think there's a big difference in my arm. It's just my legs, maybe, are feeling a little bit better than the last couple years." Rodgers told ESPN in 2017. "I think when your legs are underneath you and you're throwing from the ground up, you're probably going to be a little more accurate."